Write the following song on a chart, using a purple market to highlight the word 'purple' each time it appears. Sing the song with your children. Sometimes I eat purple eggplant. Sometimes I eat purple grapes. Purple if fun to eat, eat, eat. Purple is really a treat. I burp-le right down to my toes. Burrrrp! Purple - sung to "Turkey in the Straw"
Can you guess what that spells? Do you know what that spells? Yes purples what that spells. Like the grapes on the vine. Like the Kool-aid in your glass. Yes purple that does spell. That is all I have to tell! Before circle time, have your children make simple puppets from purple construction paper. Staple their purple paper creations to tongue depressors or craft sticks. Have the children bring their stick puppets to circle time. Use a purple maker to write the following song on a chart. Help the children read the chart. Underline the first instance of the word 'purple' and see how many others the children can find in the song. Then have the children move their puppets while they sing the song. Purple puppets like to sing, they'll do it now. Purple puppets like to dance, and they know how. Purple puppets touch the ground. If You Like The Color Purple - sung to "If You're Happy and You Know It"
If you like the color purple clap your hands. By mixing red and blue. If you like the color purple, clap your hands. etc. stomp your feet, say hoorah, etc. Purple - sung to "Are you Sleeping"
I Like Purple - sung to "Oh, Susanna"
I don't turn purple, too! Oh, that might be a funny thing to do. Brush a bit of red paint on your children's thumbs and a bit of blue paint on the forefingers. (Before you begin, instruct the children not to touch their thumbs and fingers together until you tell them to.). After all fingers and thumbs including yours are painted, read the following chant in a dramatic voice. Have your children rub together their finger and thumb. Discuss the results. At the end of the activity, provide baby wipes for cleaning purple hands. Rum-diddly, rum-diddly, rum diddly, rum. Rub your finger on your thumb. Set out sheets of white construction paper, small bowls of liquid starch and brushes. Give each child a number of violet shapes cut out of purple tissue paper. Have the children brush liquid starch on their papers. Then let them arrange their tissue paper violets on top of the starch. Give each child a Ziplock sandwich bag filled one-third full with shaving cream. Let the children take turns squeezing drops of red and blue food coloring into their bags before sealing them closed. Then have the children squeeze their bags and watch as the shaving cream turns purple. Let them use their purple shaving cream to fingerpaint designs on sheets of white butcher paper. Make colored eyeglasses by cutting frames out of desired color of tagboard and glue matching colored cellophane squares over the eyeholes. 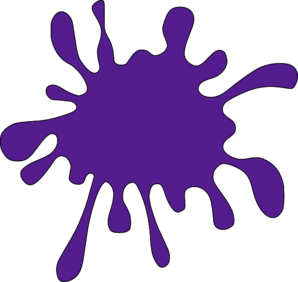 Use red and blue and combine the colors to make purple. Then attach pipe cleaners to the sides of the frames and bend them to fit over the children's ears. Cut small circles and let the children glue their own bunch of grapes. Use coffee filteres and let the children color the filters with purple markers. When they are done put a pinch of water on the filters and will create a pretty flower. Make a stem and some leaves. Place a large circle of felt on a flanelboard. Have ready a number of small, purple felt pieces in many shapes and short pieces of purple yarn. Use the shapes and yarn to create monster faces on the felt circle. Your might give your monster three eyes, four pieces of yarn hair, no nose and six scraggly teeth. Let your children take turns describing the monsters your create, using the word 'purple' in their descriptions. Then invite the children to make monsters of their own. In a zip-lock bag put about a tennis ball size squirt of shaving cream, a squirt of red paint & a squirt of blue paint (or you can use food coloring). Have the children mix it around inside the bag with their fingers until the purple magically appears. Then open a small area on the end so they can squeeze it out & they finger paint with it on a piece of white card stock or construction paper. Let the older kids make playdough, then let them use different paints or food coloring to make purple color. Put purple water in the water table. Have plenty of purple paper and colors at the art area. This is a terrific visual experience of color changes. Make red and blue ice cubes using food coloring and water. Place one red and one blue in a ziplock baggie. Place it in the science area, as the colored ice cubes melt they create new colors. Have the children keep going back to check on the process! For each child put a small amount of red liquid tempera paint and a small amount of blue into a Ziploc storage bag. Seal the bags closed. Then let the children squeeze their bags to mix the colors and create purple. Pour 1 quart milk and 1 6-ounce can unsweetened frozen grape juice concentrate into a plastic container that has a tight fitting lid. Then let the children take turns shaking the container until the milk and grape juice are well mixed. Pour into clear plastic glasses and serve. Makes 9 to 10 servings. 1) Make Vanilla pudding and add food coloring of the color you want. 2) Make Jell-O in the color you want and even add some fruit of that color. 3) Kool-Aid Art - Sprinkle Kool-Aid powder of the desired color on a large piece of white paper. Use Spray bottles to spray the KoolAid with water. It makes some very interesting artwork that smells good, too!!!!! 4) Fingerpaint with the color you are "studying." 5) Fill the water table and add food coloring of the desired color and toys of the desired color. 6) Make some colored water using food coloring and freeze it in ice trays the day or night before. Then, Put them on trays or in the water table and watch them melt to make colored water. If you use different colored ice cubes, the colors will mix to make new colors. These are some things I do in my preschool special needs classroom!!!! * Try guessing how many of the same colored buttons, beads, etc., there are in a glass jar, then count to see who came the closest. * Add food coloring to white glue to coordinate with the color of the day. * Mix cream cheese with the desired color of fruit or vegetable bits (tomatoes, pineapple, blueberries, etc.) and spread on crackers for snack. * Plan a scavenger hunt to search for objects that are the desired color. * Freeze water tinted with the desired color of food coloring in milk cartons to make ice sculptures for the water table. * Use the desired color of paper cups for stacking in pyramids or for counting. * Make finger Jell-o coordinate with the color of the day. * Tint rice with the desired color of food coloring to use for sandbox play.